Create Your Own Photo Collage Jigsaw Puzzle! PuzzlesPrint offers you a chance to make jigsaw puzzles and gifts from your collection of pictures. 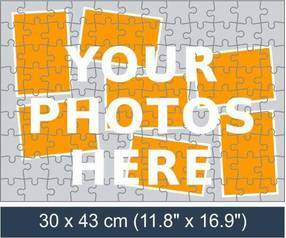 If you don’t want a single picture puzzle, we can also help craft a jigsaw puzzle using several of your pictures. And not only that, but you can also create a beautiful puzzle collage to gift to a loved one on a special day. To make your own photo collage jigsaw puzzle select puzzle size, photo collage template and upload your photos! Get The Option Of Choosing Your Layout For Your Jigsaw Photo Collage. To order, you just have to select the puzzle of your choice, complete with size, layout, and designs available on our website. Each layout comes with a different background, and you can choose one that best suits your collection of pictures. We guarantee that the printed puzzle collage will be exactly what you designed on our website. The cost of each puzzle collage includes the layout. Build your very own unique picture puzzle of your friends and family and show it to them. Create an exclusive puzzle that is fun to assemble time and time again. Freshen Your Memories With These Collage picture Puzzles! Like our other services, our photo collage photo jigsaw help make memorable presents for friends and family to remind them how important they are for you. Make important life events come to life with our jigsaw puzzles just by making your images into puzzles. Gift these amazing photo collage puzzles to your loved ones or friends and even colleagues to show them how much they mean to you.